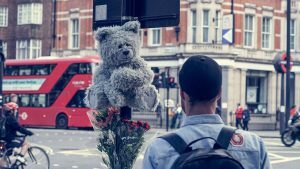 At first glance, this cuddly animatronic teddy bear seems out of place, displayed at busy London intersections and boroughs around the city. What is this furry friend doing here, and why is he.... coughing?! Meet Toxic Toby, the latest campaign by McCann London, supported by BreezoMeter's real-time, location-based air quality data, to make real to people passing by the dangers and prevalence of air pollution that sometimes blankets London's streets. Air pollution is the number one environmental health crisis that is affecting people around the world. BreezoMeter's vision is to democratize environmental data, so billions of people around the world can better protect themselves and their loved-ones from the hazards of breathing and taking into our bodies toxic gasses and particulate matter that gets deep into our systems and in turn negatively impacts our health. Air pollution affects all of us, but the most vulnerable among us, our children, the elderly, pregnant women, and people with cardiac and respiratory diseases like asthma and COPD are even more affected by poor air quality. But this isn’t your typical roadside memorial. It features Toxic Toby – a cute and cuddly animatronic soft toy that’s fighting for the human right to breathe clean air. Toby is connected to BreezoMeter’s real-time, location-based air quality data and triggers the bear to cough when air pollution reaches dangerously high levels. Toxic Toby's also connected to twitter, to help broadcast his message louder and farther, and to just the right people that need to be reached and made aware of the situation. Each time Toxic Toby coughs, an automatic tweet is then sent to local MPs warning them that pollution levels have reached precarious limits, reminding them that they need to act. Toxic Toby will be attached to street lamp posts in London’s pollution hotspots, where the levels of toxic air regularly exceed the recommended legal EU limits. The project’s goal is to use BreezoMeter’s advanced technology and Toby’s emotive power to raise public awareness around the startling health dangers of environmental contamination. Local government needs to step up action against the toxic air that’s polluting London and face the stark reality that pollution causes nearly 40 times as many deaths as car accidents. As BreezoMeter's CEO and Co-founder Ran Korber explains, “We believe that there are two ways to address the issues associated with air pollution, that are becoming more and more common in today’s news stories. The first is to reduce the amount of emissions, the actual pollution. This takes time and dedication, as well as great motivation from lawmakers and businesses – a real team effort. The second is an act we must do in parallel, and that is to understand that each of us can make better choices for our health if we are aware of what is in the air. This campaign exemplifies how media companies can harness the power of real-time, location-based air quality data, to educate, to reach, to make an impact, on behalf of a city deserving cleaner air, or on behalf of a client looking to reach consumers just at the right moment. Just like air pollution, advertising is dynamic, and reaching your potential consumer in the right place at the right time is critical for the next sale and for maintaining engagement. Companies certainly don't want to be advertising the wrong product at the wrong moment, or to the wrong person. Have you considered targeted ads? Find out more about advertising with air quality data. Are you getting excited about the potential air quality data holds for your next campaign or product launch? Get in touch with our air quality integration experts to learn more.